by Lois Fetters materials • 1 Hank Czech seed beads, size 110 main color (MC) • 5g Japanese seed beads, size 110 accent color (AC) • 30 Porcupine quills or bugle beads, size 5 • Nymo D beading thread • Beading needle, #12 • Clasp with a loop on each end or a 6mm faceted button bead • Beeswax or Thread heaven • G-S Hypo Cement stepbystep Make the necklace in three parts: First bead the neckstrap, then build the pendant as an extension of the neckstrap, and finally, add the fringe. Once you master the simple beading technique to make a daisy, the necklace is fast and easy to complete.Due to the slight size difference between Czech and Japanese seed beads, use Czech seeds for the petals and a Japanese seed for the center of the daisy.Or, if you want petal colors that are only available in Japanese seed beads, use one size larger for the center of the daisy.Secure all thread ends with half hitches and a dot of glue. Feed the tail through a few beads, and after the glue is dry, trim the ends.neckstrap Do not weave in the thread tails at the ends of the neckstrap; use them to attach the clasp. 1) Thread a needle with 1 yd. (.9m) of conditioned beading thread. Pick up 4 MC beads and slide them to 6 in. (15cm) from the end of the thread. Pass the needle through the beads again in the same direction and pull tight. Positionthe beads so two sets of 2 beads line up next to each other (photo a). 2) With the working thread exiting the last bead strung, pick up 6 MC. Pass the needle down through the top bead of the second set (photo b and figure 1, a). Pull the thread tight to form a circle. 3) Pick up an AC and pass the needle down through bead #6 of the circle (figure 1, a-b). Pull tight. 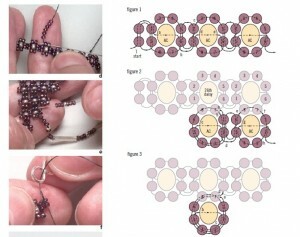 4) Pick up 2 MC and pass the needle down through beads #5 and 6 (photo c).Pull tight. The two new beads stack next to beads #5 and 6. Pass the needle up through these two beads again (b-c) in the same direction and pull tight. 5) Repeat steps 2-4 until you’ve made a total of 65 daisies. On subsequent daisies you join to the lower bead of the 4-bead set (c-d). The neckstrap will end as it began, with two stacks of 2 beads. pendant Each daisy in the pendant shares two MC beads with the daisy directly above it. There are 15 daisies in the first row of the pendant. Reduce subsequent rows by one daisy at each end. The final row consists of one daisy. 1) Start at one end and count over to the 26th daisy on the neckstrap. This is where the first row of the pendant begins. Weave a new length of conditioned thread through several daisies before the 26th. 2) Working left to right, bring the needle out bead #7 (figure 2, a). Pick up 6 MC and pass through beads #8 and 7 of the daisy on the neckstrap in the same direction (photo d). Pull tight (a-b). 3) Go through beads #1-5 again (b-c). String an AC and go down throughbead #2 (c-d). 4) Pick up 2 MC and go down through beads #1 and 2. Pull tight. Go up through beads #10 and 9 (d-e) and continue through beads #8 and 7 on the next daisy (e-f). 5) Pick up 4 MC, go up through bead #10 (f-g). Pick up an AC. Pull tight and exit through bead #2 (g-h). Repeat steps 4 and 5 for a total of 15 daisies. 6) Turn the piece and weave the thread back to the second daisy in the first row of the pendant. Moving left to right, bring the thread through bead #7 out of the daisy and follow steps 2-5 for a total of 13 daisies. 7) Continue adding rows, as in step 6.End with a row of 3 daisies. 8 ) For the single daisy on the bottom of the pendant, turn the piece and position the thread so it exits bead #7 of the center daisy (figure 3, a). Pick up 6 MC and pass the needle through beads #8 and 7. Pull tight and go through beads #1–5 again (a-b). String an AC and go down through bead #2 (b-c). Weave through the MC again and secure the thread by weaving it through the row of 3 daisies and to tie it off (c-d). 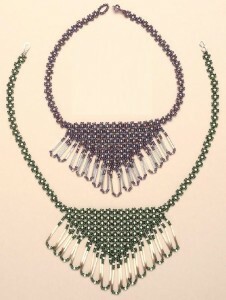 fringe Porcupine quills were incorporated in the fringe of the original necklace. 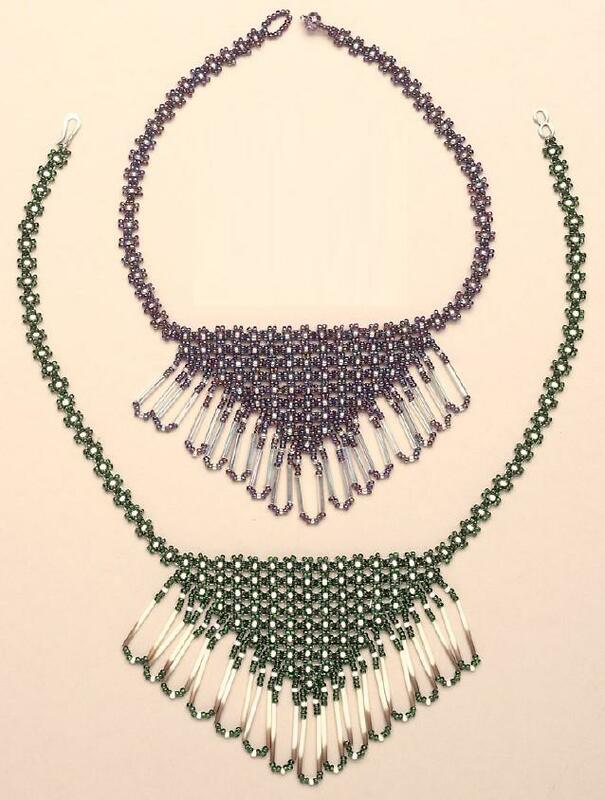 You can substitute size 5 bugle beads as in the purple and silver necklace. 1) Condition 2 yd. (1.8m) of thread. Secure it by weaving it into two or three daisies on the left side of the necklace,exit through beads #6 and 5 on the first daisy of the pendant. String 3 MC, 1 AC, 3 MC, a bugle/quill, 3 MC, 1 AC, 3 MC, a bugle/quill, 3 MC, 1 AC, and 3 MC. 2) Go up through beads #2 and 1 of the daisy, (photo e). Go down beads #6 and 5 on the second daisy in the row. Then go down beads #6 and 5 of the first daisy on the next row of the pendant. 3) Repeat steps 1 and 2 to add fringe to the edge daisy of each row. When you reach the single daisy at the bottom, work up the right side of the pendant.Finish the final daisy on the right side and tie off the working thread by weaving it into several daisies. clasp Silver clasp and loop: Thread a needle on a tail at one end of the neckstrap.Sew one part of the clasp to each end of the necklace (photo f). Repeat the thread path several times for added security. Then weave back through several daisies to secure the thread end. 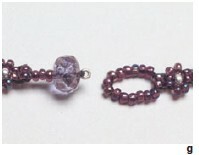 Button bead version: The clasp on the purple version is worked with seeds and a 6mm faceted button bead (photo g). 1) Using a thread tail at one end of the neckstrap, pick up 3 MC, the 6mm faceted bead and an AC. Skip the AC and pass the needle back through the faceted bead and the 3 seeds. Repeat this thread path for security. Weave through several daisies on the strap and tie half hitches (see “Basics”) to secure. 2) With the other thread tail, pick up 14 MC seeds. Check to see that this will create a loop that the button bead can pass through. Adjust the number of beads if needed. Pass the needle through these beads again in the same direction. Weave the tail back into the neckstrap through several of the daisies to secure and tie off as before.